3D rendering by Decorilla Designer, Eleni P.
There is no denying that the evolution of interior design has come a long way and one of the components making interior design dramatically more accessible (and fun) is 3D visualization. Decorilla co-founder and interior designer, Joyce Elizabeth offered that new technologies in the field are making it increasingly easier to bring people together with top interior designers in an efficient and affordable way. Professional designers now use apps such as Google Hangout and Decorilla’s interactive platform to share interior design advice and ideas with clients whether they are meeting in person or not! Below are four of our favorite virtual transformations completed by Decorilla‘s team. Be sure to slide the arrows to see the before and after difference. Eleni delivered the perfect combination of neutral and muted cool shades, cushy but modern furniture, unrefined wood and metal finishes to offer a balanced rustic elegance. With a blank canvas, the client looked forward to having a contemporary style apartment with quality furniture and interesting art. 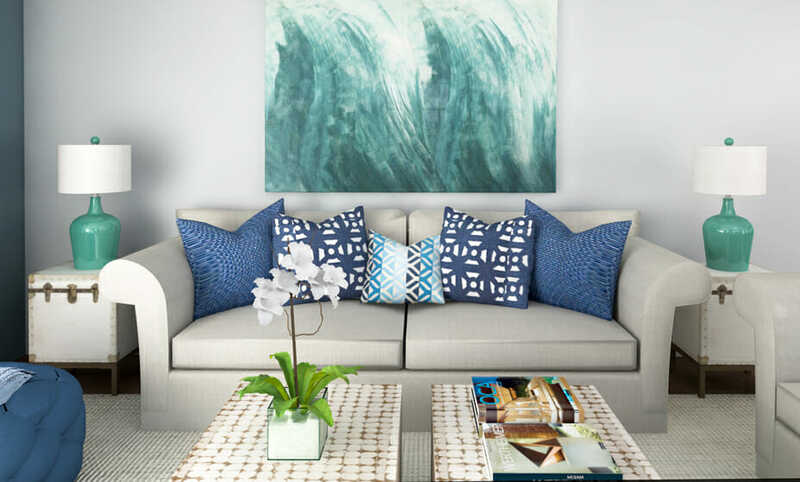 Ibrahim & Christine collaborated in carefully selecting furniture and decor pieces that showcased clean lines, rich textures, and gorgeous patterns. The result is a classy penthouse dream! A young family of four wanted a multifunctional and modern look for this 1940s style living room. Contemporary accents and a fresh color palette immediately updated the space. Picharat’s newly designed stone fireplace also offered a sleek focal point while honoring the client’s wish to keep this architecturally appealing part of the room. Along with a functional workspace, the client also wanted an office that inspired a sleek, hip, and creative vibe with a unique ceiling lighting solution. Making the most of the space, Aldrin created varied work areas that encourage collaboration and productivity. The featured bright drop ceiling also functioned as an affordable and stylish lighting solution.